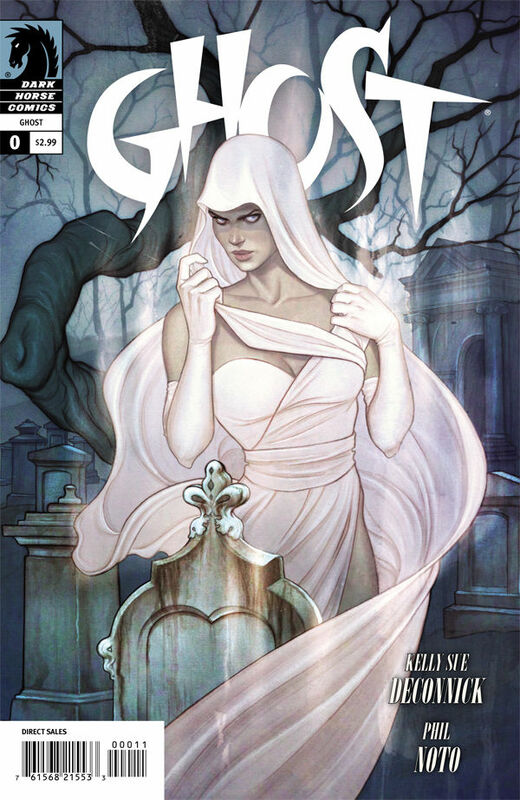 The Fellowship was fortunate enough to obtain a copy of GHOST #0 from Dark Horse Comics. The story is written by Kelly Sue Deconnick, art by Phil Noto, and lettered by Richard Starkings and Comicraft. Former journalist Vaughn Barnes has reluctantly joined forces with professional ghost hunter Tommy Byers. Tommy has stolen a mysterious box that he hopes will do…something (like raise the ratings). What is does do is brings about the ghost of a woman. Byers present the evidence to the media, but the box doesn’t work. The female apparition appears at Barnes’ home just before Tommy shows up with two men representing the box’s owner. After she deals with the two men, the three of them get rid the evidence and leave to solve the mystery of this woman. I’ve read some of the GHOST stories from the good old days and glad that Dark Horse is bringing her back. The mystery of what brought her back and the relationship between the three characters will bring me back for the mini-series (eventual ongoing?). I’m currently reading Kelly Sue Deconnick’s other book (CAPTAIN MARVEL) and enjoying her writing. Love how Phil Noto makes Ghost look more human and less the traditional super-heroine (if you know what I mean). GHOST #0 is in comic stores now and available at www.darkhorse.com.